While it has clearly been one of the slowest offseasons many of us can remember, the Blue Jays have at least been making some moves. They have addressed the glaring problem with the middle infield depth – adding Yangervis Solarte and Aledmys Diaz – and added a couple of intriguing, if flawed, outfielders in Curtis Granderson and Randal Grichuk. It remains to be seen if those moves will be enough to help improve an offense that finished dead last in the American League in runs last year, but there’s no doubt the floor has been raised. As such, all indications are that the Blue Jays have turned their focus to addressing the pitching staff. Going into the offseason they openly expressed a desire to add a veteran to the bullpen, similar to the Joe Smith (good) and J.P. Howell (bad) signings last year. This became even more pronounced when Dominic Leone was included in the trade for Grichuk. As for the rotation, the requirements there are apparently a source of some debate in the Blue Jays front office. Some feel the team needs only to further address the depth (which is already much improved compared to last year), while others feel the Jays should be looking for an upgrade over their fifth starter. That starter, of course, is Joe Biagini. 2017 was by all accounts a disaster for the former Rule 5 pick. After a good start to the season in the bullpen, he transitioned into the rotation. Following two very solid – if short – starts, all the wheels fell off. Biagini struggled so much that he was returned to the bullpen. He didn’t pitch any better there though, so he was sent to the minors before finally coming back for some more poor starts to finish the year. Everything got worse as the year went on. 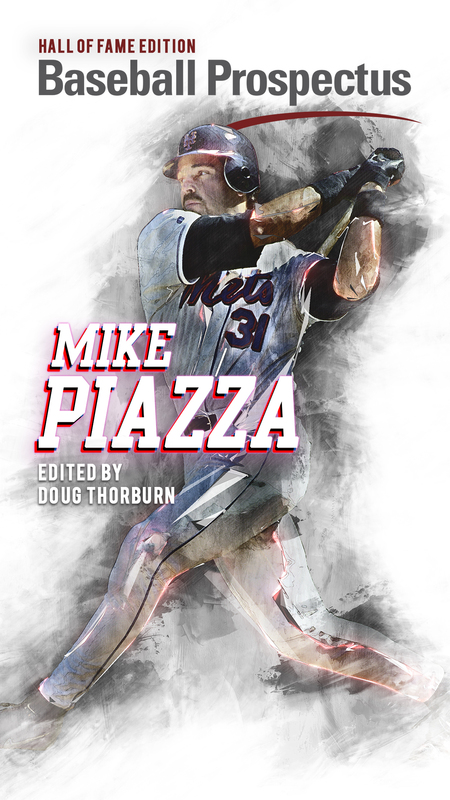 He was striking out fewer hitters, walking more, and giving up more home runs. All of that is bad. However, there are some reasons for hope. 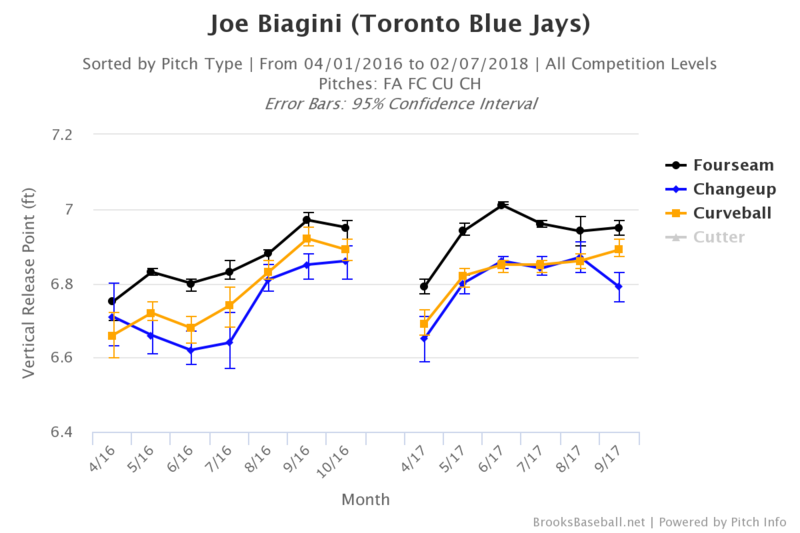 After Biagini was sent to the minors and actually built himself properly as a starter, there was a noticeable change in his velocity. The most glaring difference there is in the vertical movement of Biagini’s curveball. The tall righty lost 1.5” of vertical break on the offering from his first outings as a reliever to his final turn as a starter. That makes a huge difference both in the ability to get swings and misses and in getting people to chase at offerings out of the zone. That would decrease strikeout rate while also helping to increase the walk rate. He also lost some spin on the breaker, going from 2907 RPM on average at the start of the season to 2825 RPM by the end of the year (per Statcast). 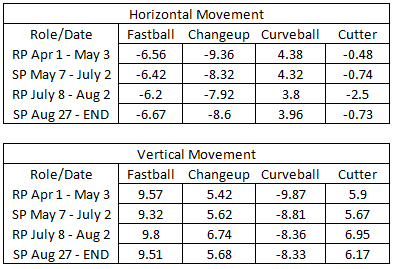 The changeup also took a step back with a loss of horizontal movement from its initial break. Biagini altered his release point. While he was throwing more over the top all year than in 2016, his release changed even more over the course of 2017: Across the board, Biagini was throwing pitches about 2.5” higher than he was at the beginning of the season. His vertical release actually very closely mirrored the numbers from his horrible September in 2016. 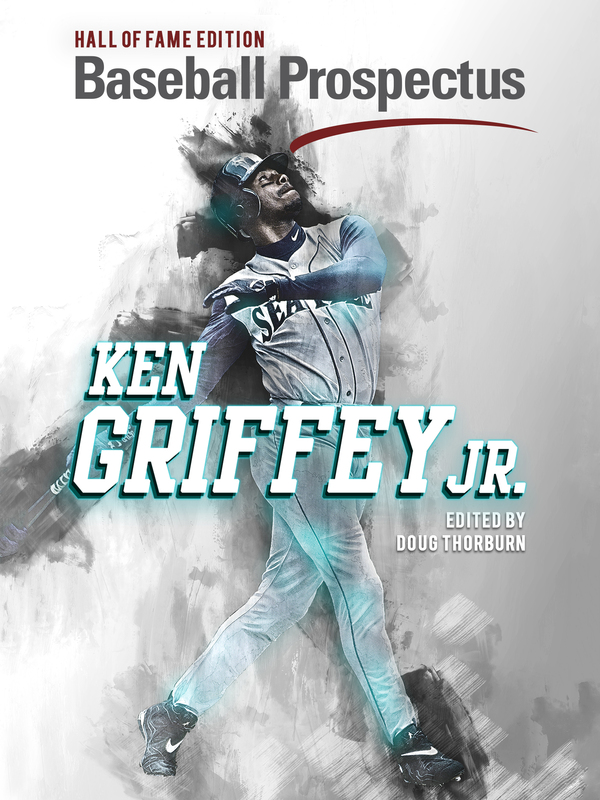 By releasing the ball higher, he would not be able to get as much snap on the breaking ball (reducing the spin), while also affecting the fade of the changeup. If he can fix this and get it closer to the levels from April of 2017 and most of 2016, the stuff should return. So what does this all mean? Essentially, it means that there is still some hope for Biagini as a viable major league starter. His velocity rebounded with proper preparation and the problems that led to a dip in his offspeed stuff seem to be fixable. The bigger question is “does that mean he should open the season in the no. 5 spot in the rotation?” In short, no, it doesn’t. There is still enough risk present with Biagini (and with the offense) that the Jays should still be looking to upgrade in the rotation. What this information does do is help tell us what level of pitcher actually is an upgrade by suggesting that Joe Biagini should be better than he was last year. If the best free agent the Jays can sign is a guy likely to post a high 4.00s ERA (rudimentary stat, but it helps here), they should probably use their resources elsewhere. If they can do better than that, they should. Thankfully, there are enough decent starters out there (Cobb, Lynn, Cahill, Tillman, J. Garcia, B. Anderson, even Jason Vargas) that this shouldn’t be a problem. Then they can let Biagini test all the theories above in Buffalo or end the experiment forever by making him a permanent two-inning reliever. 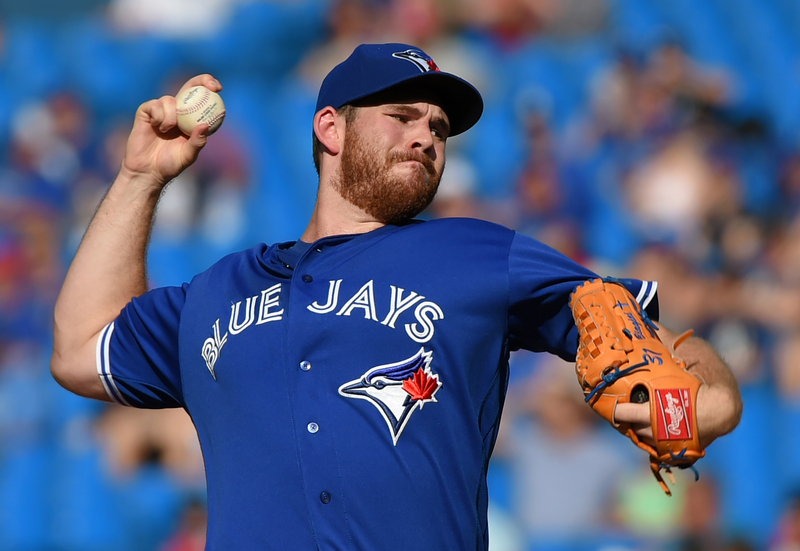 One way or another, Joe Biagini should pitch better in 2018. We just hope it’s not as the no. 5 starter.